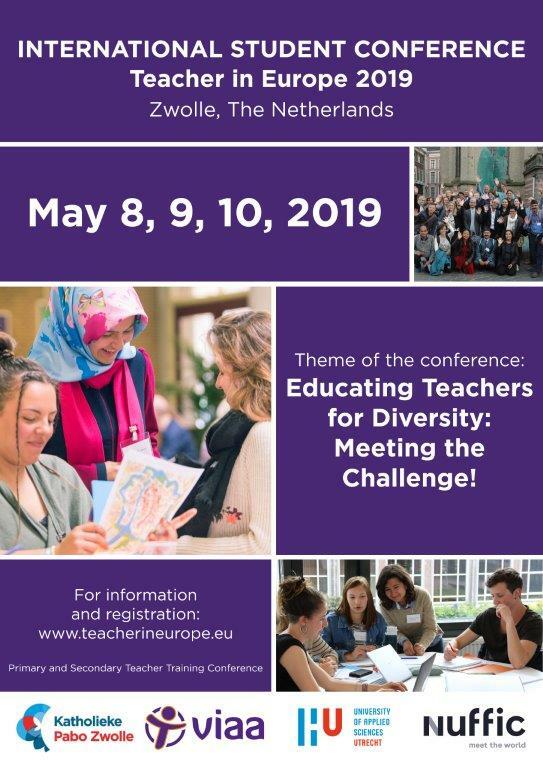 The student conference ‘Teacher in Europe’ is a three day conference for future teachers at primary and secondary schools. You will meet students from all over Europe and together you will learn about internationalisation: “What is internationalisation? Why is it important for your future job as a teacher? What projects can you do with your pupils? What are best practices? You will learn about all these matters and more in lectures and workshops and you will be part of a small student group (with a coach to help you along) with whom you’ll develop an international project. Meet-up with students from all over Europe. The language at this student conference is English. Katholieke Pabo Zwolle is organizing this annual conference together with Viaa and Hogeschool Utrecht. Nuffic partially sponsors the conference.